ASUS Cerberus Mech RGB is the latest gaming keyboard in the award-winning Cerberus series. Kaihua RGB switches Red, Blue, Brown and Black provide tactile, lightning-fast response and an ultra-durable lifespan of up to 70-million keystrokes. A responsive design with 100% anti-ghosting and N-key rollover (NKRO) technology ensures each keystroke is logged, even if you press numerous keys simultaneously. 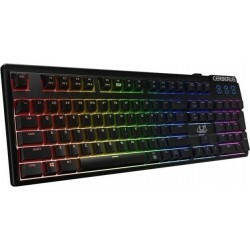 Cerberus Mech RGB features individually programmable backlit keys that shine in your choice of millions of colors. Along with seven built-in lighting effects in customizable colors, you can easily create a personalized keyboard that enhances your gaming experience. Get this high end motherboard at a low price, clearing stock. Equip your first grade gear with a first grade accessory and let your hands enjoy maximum comfort. Cooler Master’s MasterAccessory Wrist Rest was specially designed for the keyboards of MasterKeys series and further enhances their user experience.